Would this be a Finalist for the 2016 Floating Bach Award? Interested to learn more on the other woodys below (Safari, Camaron, Rawene) & get some details on their past & how they ended up at the lake + there are a couple of plastic Logans that I’d be keen to name. Note: for the overseas ww followers – Lake Waikaremoana is situated in the Te Urewera National Park, in the North Island of NZ. Some spectacular walks & just wow scenery. A few photos below. 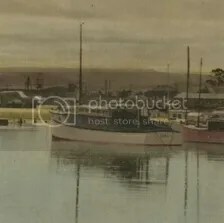 29-12-2016 Update – Photos below of Rawene – sent in by Toni Metz – read more about the boats history in the comments section below. These photos were taken in the 1930’s at Waikaremoana. In the second photo, Rawene is the last boat in the line below the shed. This entry was posted in Launches, Non Waitemata, Spirit of Tradition and tagged Camaron, Lake Waikaremoana, Rawene, Safari by Alan Houghton - waitematawoodys.com founder. Bookmark the permalink. Hi Nath – Rawene was the second launch Mr Coulthard built for Alexander Alexander – so maybe Havoline was the first? Havoline was a brand of lubricating oil around the 30’s. One Auckland 18 footer was rebranded “Havoline” for a brief period at this time too. There are two Logan replicas which regularly moor at Waikaremoana, one is named Cachette, owned by Cedric Witters from Gisborne. Cachette is currently using the Rawene mooring until Rawene returns to Waikaremoana. The original Buda engine and gearbox as fitted to Rawene is complete and in storage. It was still a runner when replaced with a 4 cylinder Ford Diesel and is another restoration project waiting in the wings..
That’s 6 Cylinder not ^ cylinder! She’s in my “Which Launch?” database as built by Coulthard in October 1928 for A. Alexander of Hastings and fitted with a 90hp ^ cylinder Buda “for off-shore cruising in Hawke Bay” see NZ Herald 4th October 1928. Another mystery solved! Good stuff. It tool me a fair bit of research to discover barely 1/4 of what you have written! In a 1938 colourised photo of Ahuriri her name almost appears as ‘Havoline’ but must be wrong. Beside her in the 1938 photo is another launch bearing a striking resemblance to my Coulthard Lucinda as launched, sort of. Rawene looks to have been on that mooring since the very old days, I have come across photos which include her with the majority of current superstructure aside from Tauranga deck and raised cockpit top present. Same double saloon windows but with rounded tops. A nice boat. Using Alan’s zoom and my famed Squint-O-Meter (Patent Pending) I’m reasonably sure that the first Logan 33 is Cadeau Hull No.25 built in 2004. She was at Half Moon Bay until advertised on TradeMe in Feb 2013. That last Logan 33 is an older model, with single roof hatch above the helm and clears on the side canopy. 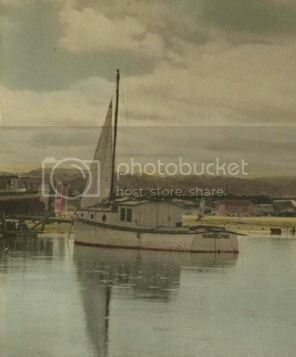 Possibly Cachette, Hull No.10, which was built 2001 for an owner in Gisborne. The other is a more recent job with twin hatches, glass instead of clears, and a side name plate – which is very small. Possibly Lyric Hull No.19, built 2002, which was sold to Taupo in 2009. Any chance of a zoom on that name plate?